Launchpad couldn't import bug #47181 from Linux Kernel Bug Tracker. I'm not sure how I triggered this. I've been moving around between networks and suspending/resuming all day. [25800.412234] INFO: task lxc-start:25817 blocked for more than 120 seconds. [25800.412243] "echo 0 > /proc/sys/kernel/hung_task_timeout_secs" disables this message. Can you tell us how to reproduce this issue? From the dmesg kernel warning opps, I think it is not lxc/cgroups specific issue. Looks like lxc-start was blocked by some stuff for a long time. Is there any heavy workload on your system? Sorry, I don't yet have a recipe for reproducing it. I did manage to get the system into the broken state again after I filed this bug report by suspending/resuming and starting/stopping/using containers as usual, but I can't trigger it on demand. As for heavy load: not at the point it breaks. The main container I use is one I'm working on some Launchpad changes in. I often run the test suite inside it, and I guess that is rather heavy. hmmm, that's very hard for us to analyze. We did meet a similar oops before because of the heavy workload and CFQ block IO scheduler. Could you a test for us? change your default Block IO scheduler from CFQ to deadline and run LXC as usual to verify this issue is gone. I'm just guess and hope this can do some help. I'm quite surprised that with all of these tests I haven't got the mutex_lock bug again though, it was definitely happening on that machine... maybe some other fixes fixed it or I'm just not exercising the exact code path that's triggering it. [194040.576173] INFO: task lxc-start:23872 blocked for more than 120 seconds. [194040.576178] "echo 0 > /proc/sys/kernel/hung_task_timeout_secs" disables this message. [194160.576246] INFO: task lxc-start:23872 blocked for more than 120 seconds. [194160.576251] "echo 0 > /proc/sys/kernel/hung_task_timeout_secs" disables this message. I can reproduce it very reliably on my system after shutting down an LXC container with poweroff from inside the container. I'm setting to High because then the container cannot be started again without restarting the host system, and the host system won't shutdown waiting forever for lo to become free. Only SysRq helps in that case. Looking around for this bug, after getting it myself a few more times... I found http://lists.debian.org/debian-kernel/2012/05/msg00494.html which mentions a similar behaviour. Running it, indeed triggered the issue here, any subsequent call to lxc-start will just hang. So it looks like, whatever the issue is, it's triggering when trying to clone(CLONE_NEWNET). Hope that helps point towards the right direction. As Jean-Baptiste says, this bug is extremely annoying as anyone using LXC and hitting this bug (that part seems quite random) won't be able to work until they power cycle the system, would appreciate if someone could actually look at this. For some reason I've still never seen this. It appears that reproducing it that way is very reliable here, though the result is slightly different. Using this reproducer, the container will usually hang at startup for a few minutes, then eventually succeed to boot. When getting the bug without that reproducer, it'd usually hang indefinitely (where indefinitely > 10 minutes). I have finally been able to reproduce this, but it takes me much longer than it does Stephane. I reproduced this on the first run of my lxc-ized buildbot setup script on a quantal host, so it's likely to hit real users. I can reproduce this as Stephane's mentioned, but I only got message like "unregister_netdevice: waiting for lo to become free. Usage count = 2". There is no other oops messages like mutex_lock() and I think the oops is because lxc-start was blocked for too long. So probably the subject of this bug should be changed. we can still get the same error message. looks like the first try reproducer didn't release loopback device. I update the bug title to better match what we're seeing. The oops from the description is indeed just a timeout from some user space task that's stuck on clone(). So it looks like there's something wrong either in the cleanup code when flushing a network namespace (when the last process in the namespace dies) or something wrong with the refcount. As Eric W. Biederman said in the bugzilla, 3.6-rc1 mainline version works. I've testing our Ubuntu mainline build like 3.6-rc1 and 3.6-rc5, which all work fine. But for 3.5.3 mainline build, this test failed. Our latest Quantal kernel is based on 3.5.3 kernel. So obviously this issue was fixed during 3.6-rc1, I'm going to do some investigation and backport those fixing patches. From Eric's reply, I found this issue is a little bit complex to backport some patches from 3.6-rc1, because from 3.5 to 3.6-rc1 some fundamental stuffs were changed. some significant changes to the fundamentals. What to look for failure of dev_hold and dev_put to pair. configuration may not reproduce the problem. I hope those hints help. But we won't use 3.6 kernel for our Quantal release. I run into this bug daily, it severely cripples the juju local provider on quantal. I added debugging to dev_hold and dev_put as Eric suggested and used the reproducer attached to this bug. What I saw was creation and destruction would be balanced. However on the connect call, there were another two dev_hold() calls that seem to be exactly those references not been returned. Unfortunately the stack traces miss the details about going into ip_route_connect, but with more printks I know that ip_route_output_flow() is the one failing with -EINVAL. Comparing functions between 3.5 and current linux-HEAD I was not very successful in spotting the important difference. I guess I am at the limits of my knowledge. So far it looks like ip_connect_route initially calls __ip_route_output_key to fill in source and destination address. And this seems to cause a routing cache entry to be created with source and destination address 0. This is an experimental change that at least avoids the problem when running the test case. But while I saw no immediate problem, it isn't guaranteed to have no side effects and neither I can be sure there is not another case (only either source address or destination address not set) that would still suffer from the problem. I added the same patch to the upstream bug report in the hope that this causes someone there to help with some information. As testing with lxc containers showed, the clever idea does not work there because that is a case where there is at least one of the addresses (actually it seems both) is set. So it more and more looks like the real problem is that whenever the namespace is to be torn down, there is nothing enforcing to immediately evicting and releasing elements in the route cache that belong to the interfaces in that namespace. 2. Cleanup was aborted, we leak the bits in the route cache but at least new net namespaces are possible. This second attempt goes the path of forcing the route cache to be cleaned of entries belonging to a net device that is torn down. When looking at the patch uploaded I realized something went wrong on the update. Re-attaching. Another step towards solving this. After it turned out in the upstream discussions that actually the route cache should be flushed when unregistering by doing the NETDEV_UNREGISTER_BATCH notify call, I could check to find out that this fails because the notify handler checks for dereferenced pointer that is not only not set but also not really necessary. Moving the handler around a bit should actually fix this. Clint, could you please write down exactly which steps you do to reproduce the issue that leads to the single reference remaining? Which arguments to lxc-create/-start/-stop? Any special network setup? I think that with the last patch I made we fixed one issue, though that (while easier to reproduce) is not the same as the case which leaves one reference and does not resolve itself over time. Now the other question is whether it will be possible to fix the other issue in time and on the other side whether adding the fix we already have on last minute, even though it does not completely fix things. Attaching syslog for latest fail. Certainly something is very wrong with the numbers. Looking at the numbers reported we get 5/13/-17/0 which sums up to 1 which is exactly the refcount complained about. 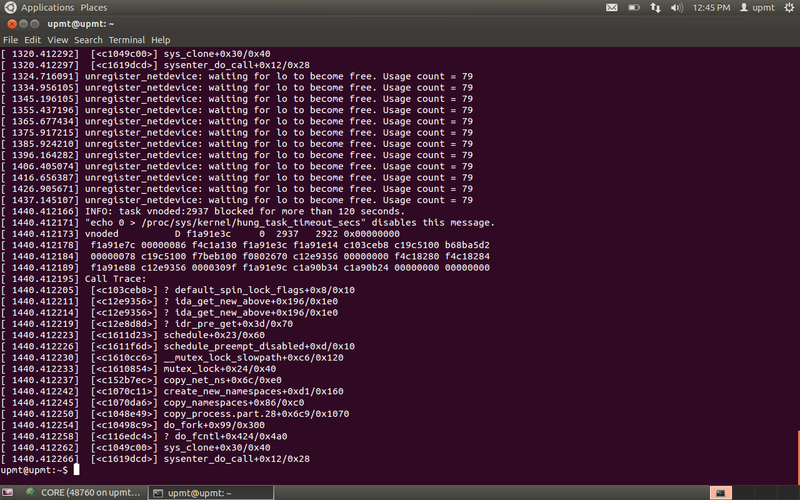 But looking at the individual numbers, the counter for CPU#0 starts with 5 not 0. And just adding up the dev_hold and dev_put calls I underrun down to -4. So it looks a bit like some magic suddenly warps the counter and we release more often than we appear to take the reference and still end up one too high. It is a bit too late to think about it but maybe loopback gets assigned elements from another interface and that count is off by one. ok I can reproduce with just this shell script. The weird thing is, it only reproduces if I watch the log and kill the container after it fully boots. Ok, I think I'm ready to say that there are really just two bugs. One is about the route cache, and is addressed by smb's most recent patch. The other one seems only to affect my macbookair. I have not been able to get the repro.sh script to reproduce the problem on any other machines with that kernel or a 3.6 kernel installed. Further information, this appears to be related to the wl proprietary drivers. When I tried on my MacBookPro with wired network, the problem did not surface, but upon switching to wireless, the problem did surface. This suggests that the real problem lies somewhere in the wl driver. Ok, it is probably obvious that we went ahead and applied at least the patch to the first half. Clint, probably we/you should open a second report for the remaining issue to have things cleanly separated. I'm running 3.5.0-19-generic (3.5.0-19.30) and I still get this bug. I guess, yes: the other bug causing refcount leaks: bug #1065434. I attached a screenshot with dmesg after I tried to start again my containers. > Should I open a new bug ? > ** Attachment added: "screenshot"
> networks and suspending/resuming all day. > [25800.412234] INFO: task lxc-start:25817 blocked for more than 120 seconds. > [25800.412243] "echo 0 > /proc/sys/kernel/hung_task_timeout_secs" disables this message.